To get a sense of what we were looking for, we started off by watching a few short video clips of different microorganisms. Then the kids prepared their slides, making sure to get a sample of pond water that was nice and goopy. After hunting around a bit, the kids turned up some interesting single-celled organisms and even a water flea. 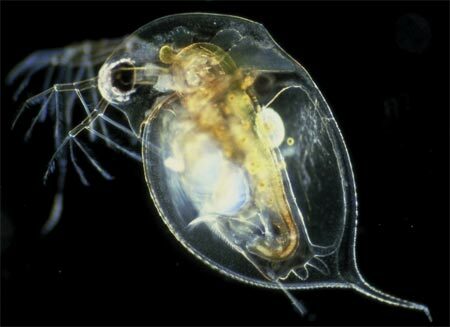 What's cool about this little guy is that being transparent means you can WATCH its heart beat! This week we studied etrogs from a biological perspective. First we classified them as citrus, a type of flowering plant and talked about the role flowers play in helping plants reproduce. Etrog trivia: What part of the flower is the pitom? Then we asked the question: What's the difference between an etrog and a lemon? The kids started off by making some external observations: shape, color, volume, and weight, and then they opened them up and looked inside. They noted differences in the relative proportions of peel and fruit as well as differences in the volume of juice. They took the pH of each fruit and congratulated themselves on a job well-done to the tune of a tall glass of lemonade. Etrogade, we learned is pretty tough to make given how little juice each fruit contains.